There are two circulatory paths in the cardiovascular system namely pulmonary circulation and systemic circulation. Pulmonary circulation path allows for blood circulation through the lungs for oxygenation of blood while systemic circulation path allows for blood circulation of the oxygenated blood through other parts of the body. Pulmonary circulation involves the pulmonary capillaries with the blood first moving to the lungs from the heart for oxygenation and then returning back again to the heart. The blood enters the pulmonary circulation stream from the system circulation stream when the blood with depleted oxygen reserves reaches the right atrium via the inferior and superior venae cavae. From the right atrium, the blood is pumped into heart’s right ventricle via the tricuspid valve. Afterwards, the blood enters the pulmonary artery via the pulmonary valve. The pulmonary artery divides into two arteries with one artery entering the right lung and the other artery entering the left lung. 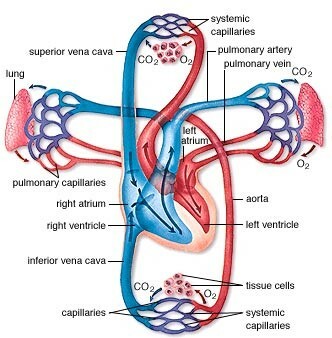 When the blood reaches the lungs through the left and right pulmonary arteries, it moves over alveoli via the capillary beds and this is the place at which respiration takes place. During the process, the blood gains oxygen and sheds carbon dioxide. The alveoli themselves are simply air sacs and are responsible for providing a platform where gas exchange can take place during respiration. After the blood gets oxygenized, it moves back to the heart and this time moves into the left atrium, completing the pulmonary circulation path. From the left atrium, the blood moves to the heart’s left ventricle via the bicuspid valve. After reaching the left ventricle, the heart pumps the blood to the aorta via the aortic valve and from here on in, the blood completes its systemic circulation circuit where the oxygenized blood is delivered to different parts of the body before returning again to the pulmonary circulation. The basic functions of the circulatory systems include delivery of nutrients, oxygen and hormones. Moreover, the circulatory system is also responsible for taking away waste products. Whether it is pulmonary or systemic circuit, there are arteries which lead away from the heart, capillaries which connect arteries to veins, and veins that take blood toward the heart. The pulmonary circuit transports blood between the heart and lungs. The systemic circuit returns blood containing small oxygen content to the heart’s right side. The pulmonary circuit’s arteries take this blood to the lungs where it gets oxygenized with the help of pulmonary capillaries. Afterwards, the oxygenated blood is moved to the heart’s left side from where it is once again provided to the systemic circuit. The pulmonary veins and arteries are unique in the type of blood they transport. The pulmonary arteries transport blood low in oxygen from heart’s right side to the two lungs. The pulmonary veins, on the other hand, transport oxygen rich blood to heart’s left side. The circulatory system in humans as well as in other mammals is basically a closed circuit. The blood in the circulatory system stays restricted to blood vessels and the heart. The heart pumps the blood and it keeps on flowing through veins, venules, capillaries and arteries. The process of gas exchange in which the blood gets oxygenated occurs across a two cell-barrier with the barrier formed between alveoli and pulmonary capillaries. The barrier itself is made up of one cell epithelial layer of both pulmonary capillary and the alveolar wall. For efficient exchange of gas, the membrane formed between gas and blood has to be thin and has to have a large surface area. The alveoli as well as the pulmonary capillaries have thin exteriors in order to reduce resistance to diffusion. The capillaries are allowed to create a dense network within the alveolar walls that looks like a thin yet continuous blood film. As a result, the capillary surface area is kept large. The pulmonary circuit’s pressure is greatly lower as compared to systemic circulation. Moreover, there is a very small value of pulmonary vascular resistance too. The pulmonary circuit pressure’s value is just enough to perfuse the lungs’ apical areas.